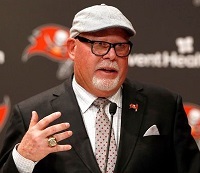 Joe was eager to talk to the resident Tampa quarterback whisperer, new head coach Bucco Bruce Arians, about scouting quarterbacks and competition at the position. Arians seemed just as eager to answer Joe’s questions yesteday. JoeBucsFan.com: Coach, you’ve said before that if you have two quarterbacks, you have none. Do you think that was part of the problem with the Bucs last year. Bruce Arians: That’s my philosophy. I think sometimes they were both looking over their shoulder. You know, one would do well for one week then struggle and put the other one back in. That’s not me. We got a guy; he’s our guy. Hopefully we can get that room extremely competitive behind Jameis so we can win with them if something happens. Joe: Do you scout quarterbacks every year in the draft? Arians: I have every year. Even thought we didn’t need one, I just liked ranking them when they were coming out of college and then watching them be successful. Joe was intrigued by Arians saying he scouts quarterbacks, and he flashed a broad smile when he did. Dirk Koetter often said he didn’t spend time looking at QBs because the Bucs weren’t going to draft one. What will Arians think of the 2019 QB class? How much draft capital would he consider investing in a QB? Third-round? More? Less? And how does Arians’ life motto, “No Risk It, No Biscuit,” apply to the draft? Exciting having some competency in the building. he’ll be a great molding project for bruce….kid has been compared to cam newton….he’s 6’6 and runs a 4.5/4.6…..throws a better ball than cam now than he did in college….played at buffalo and had a knee injury the year before but he bounced back fine….he ran less which helped out his passing and accuracy…..i think he’s coming out too early imo….he can be had in the mid rounds…. Maybe we will “win” the draft this year. It’s the “Real Season” for our Bucs. and it seems to longer and be more interesting than our 16 game and no playoff schedule. you and me both brother….lol…. i was watch film on greg little and jeffery simmons last night….lol…. The most important $hhiit he said in that press conference was… he was going to have a huge staff and the people will see two practices going on at the same time. Why? Because the dam rookies can’t just be standing around watching getting one rep a practice. They need to learn by practicing and getting reps so he can see which ones can play…. Dam! What a novelty. I like the hire even tho I am in a wait and see state of mind due to many years of disappointment (decades really). One thing that is bothering me is that as far as I know there were no current players as the presser and that I have not seen any congratulation messages or tweets from current players. I thought that I would at least hear of one from Jameis about how excited he is to have Arians there. But, so far its been crickets. Maybe there have been some that I have missed but I keep a pretty good eye on all the sites with Buc news. I always said the rookies & FA didn’t get enough practice time to be evaluated properly. That’s why the Bucs & other teams release players & then turn up on other teams & play well. Ira says draft a QB, 3rd round. I don’t see Arians drafting a QB at all. If anything, he’s gonna have his eyes on Linemen and the Defensive improvement. Could probably say same thing for a lineman on each side of the ball. Bucs draft 5, the Giants 6, Jacksonville 7, Broncos 10. All but the Bucs need QB’s. Haskins will likely be the 1st QB drafted. Were it me, I would tell the Giants that we’re working on a trade with J’Ville../make us an offer. Trade with them. Then I’d go to J’Ville and tell them we’re working on a trade with the Broncos, whatcha got? Trade with J’Ville. Screw the Broncos. Then I’d take who we would have taken at 5 anyway, Greedy Williams. Not a bad strategy, right? Plausible? Best thing BA can do is put together a competent Defense and run game, so we can see if that’s enough to salvage Winston. Just don’t see Murray as much of a long term NFL QB..what is he..5’8″? Unless he’s the next Doug Flutie. I like it. Last year there were similar trade scenarios. When the 3 blue chips were gone (nelson/barkley/chubb) everything made sense to trade down. Guessing the same will occur this year. No one needs to jump us for a QB. The combine will be big this year. That’s where the DT group will separate themselves a bit in terms of projected athleticism. If Greedy Williams tests well which he should I’m guessing he’d be considered that next blue chip player, but I’ve also read really good reports on the Penn State CB and the Washington CB. All 3 are at least 6’0. DeAndre Baker is shorter at 5’11 but supposedly has really long arms. At OT Jonah Williams is the consensus best lineman but I’ve read concerns over where he fits best in terms of OT or OG. This is not like Quenton Nelson where you know he would just plug into LG and sit there a decade as an all pro. God dang if only we had that hog mauly next to Jensen and Marpet at RG. If it emerges that Williams is a consensus LT and a beast at that – he could be another blue chip target. Lord C., 813- Welcome to the club! LOL! See, even though some might think all our QB troubles are over, smart organizations/coaches have a ‘plan B’. It’s not an indictment either way, it’s a fact of life in the NFL. Players come and go through injury, attrition, or lack of production. For instance, if Jameis gets injured in OTAs and is out for the season, who’s the back-up? If the back-up gets injured in game 2, who’s his back-up? Arians was down to his 4th QB in ONE season, ONE! This is ‘exhibit A’ as to why I thought Arians was a good hire. In fact,it almost seems like it should be common sense for organizations to prepare as such. I’ll say it again- this team NEEDS Devin White/LSU to be Bruce’s Alpha on D.
Count me as another member of the Lord C mock-draft myself crazy cabal. dont want to get caught with our pants down…. I will echo a strong look at Devin White MLB at LSU. He has until Monday to decaler and hasn’t yet. And don’t forget Leighton Vander Esch or whatever in Dallas. We do enjoy drafting LSU LB’ers. You could be on to something! 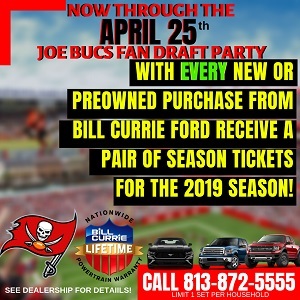 This will be one of the most interesting (and important) off-seasons to follow in my 43+ years of being a Bucs fan. Really looking forward to seeing BA build a winner! Let’s hope some teams trade up for QBs. Well, it just so happens that we have no backup QB at the moment. Both Fitz and Griff had their contracts run out at the end of the season. This pretty much tells me that Fitz won’t get another offer though. Hopefully, he will draft one in the 3rd or 4th round…just to develop as a backup…and if that guy happens to do well if needed, he’ll become trade bait. Keep in mind…Arians is the guy who turned a kicker into an award winning quarterback. Casey GTFOH. You Winston haters are so annoying. This team has so many holes and you want to waste a 2nd rounder on a reach instead of addressing a real area of need. You can’t be a real fan because real fans hate losing and want the team to address real needs and start winning some damn games. In the draft, I believe the Bucs are in the catbird seat at #5. The Bucs don’t need a QB. The Giants need one at #6 and the Jag’s are desperate for one at #7. There is only one very good QB in the draft this year. Haskins from Ohio State. The 1st four teams to pick don’t need a QB and there are very good picks available to them. Game changers. The Bucs are missing their 3rd round pick. If Licht plays it cool on Draft Day, He could get the Jags 1st, 2nd and maybe even a 5th rounder to allow the Jags to leap frog the Giants. The best thing is that with the Jags and Giants (Lock-Missouri) drafting QB’s, they will still have the same players available at #7 that they had staying at #5. Then the Bucs can choose Greedy Williams-LSU CB, Quinnen Williams Alabama DT, or Ed Oliver Houston DT. There is also an OT from Alabama Jonah Williams. we do have a third rd pick this year. the trade for jpp gave up a 2018 3rd round draft pick. we still have our 2019 pick.